'Collective commitment of the UN member states would help peacekeeping missions' - Integration Through Media ....! 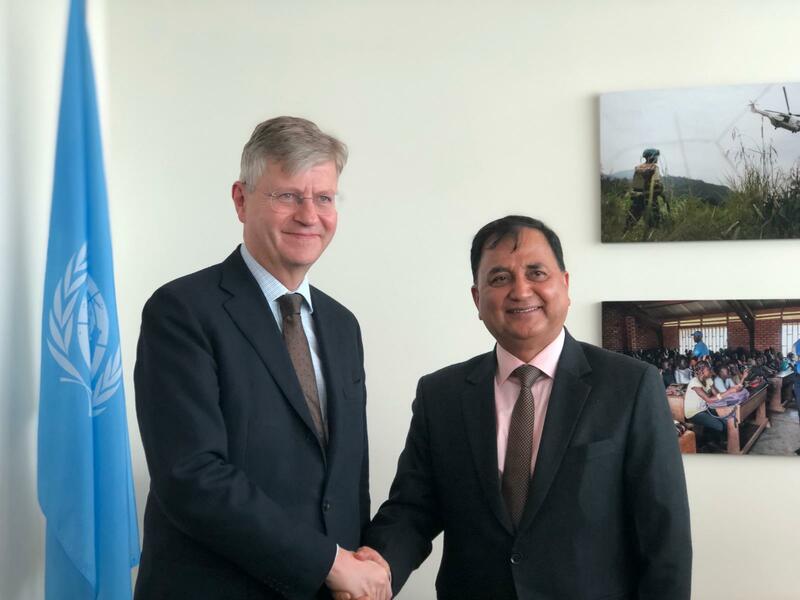 NEW YORK: Nepal Deputy Prime Minister and Minister of Defence Ishwar Pokhrel held a meeting with the United Nations Under-Secretary-General for Peace Operations Jean-Pierre Lacroix this afternoon. During the meeting, the two sides discussed the issues related to the UN peacekeeping, including its critical role in the prevention and resolution of conflicts in the areas of its deployment. While congratulating the UN for a successful convening of the Peacekeeping Ministerial yesterday, DPM Pokhrel expressed his hope that a renewed collective commitment of the UN member states would help peacekeeping missions deliver effectively on their mandates. He also raised Nepal’s concerns on ensuring safety and security of peacekeepers for enhancing their morale as well as performance. Under-Secretary-General Lacroix thanked Nepal for contributing its peacekeepers, without caveats, for more than six decades. While noting Nepal’s inclusive policy for encouraging female recruitment in Nepali security forces, Mr. Lacroix congratulated Nepal for meeting the UN target of female representation in staff officers, military observers and individual police officers. During the meeting, Amrit Bahadur Rai, Permanent Representative of Nepal to the UN and other Nepali officials accompanied the DPM and Minister of Defense while UN Under-Secretary-General Lacroix was accompanied by UN Military Adviser Lieutenant General Carlos Humberto Loitey and other high officials of the UN. Later in the evening, Deputy Prime Minister Hon. Pokhrel attended an interaction program with the Nepalese business community organized by the Consulate General of Nepal in New York. DPM Pokhrel is scheduled to attend an interaction programme to be organized by the Nepalese community residing in New York, tomorrow.